Minnesota Grown Wild Rice Soup, a dry soup mix. A classic soup that's easy to prepare — a little makes a lot — healthy and very low in sodium. Like all of our soups, Minnesota Wild Rice Soup is vegetarian as is — modify as you wish. Ingredients: Minnesota-grown wild rice, barley, yellow peas, green peas, and the following air dried vegetables: onions, carrots, whole kernel sweet corn, celery, green beans, green and white leeks, green bell peppers, and red bell peppers. Common uses: Soup, and, steamed off, a side dish. 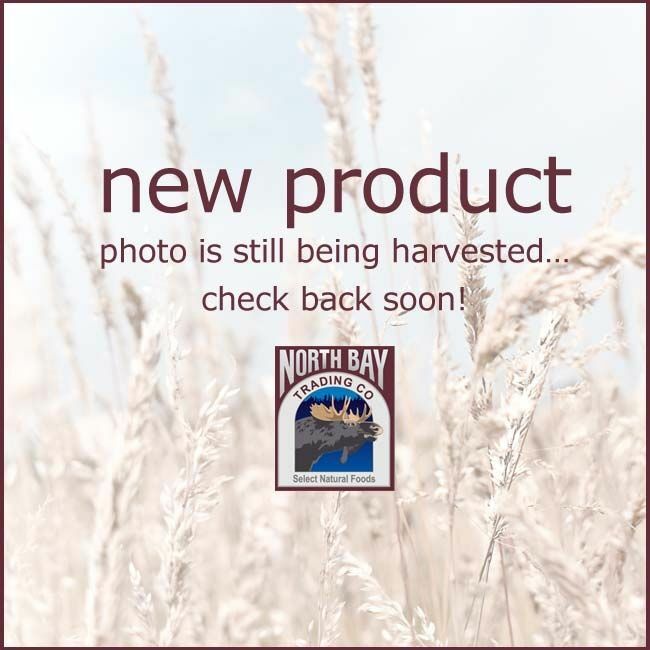 Brand name: This soup mix is labeled "Thousand Lakes Food Company," a brand of North Bay Trading Co.
A popular gift item: Use our multiple-address and gifts-messaging features to send Minnesota Grown Wild Rice Soup to friends and family. Made this delicious soup for the first time 2 days ago. Made it simply - with just broth then salt & pepper. Delicious and complex in flavor. (I’d read that it’s a good soup the 2nd day.) I like tomatoes in soup, so after thinking about if for the 2nd day added: tomatoes (or Rotel if you like things things spicier. ), bay leaves, a wee bit more dried veggies- garlic, onion, cabbage, celery, carrots and green beans. Added just a bit of spice - 3/4 tsp sage, about 1 tsp thyme, maybe a half teaspoon rosemary, adjusted the S & P, added more water, and finally about half pound ground turkey. Oh my goodness!! Fabulous and totally different! I love the textures and especially the wild rice. For the 3rd version I’m curious to try something different and creamy. It was suggested above to add a cream soup. So i’ll try DIY Cream of Soup (1 recipe cream of chicken, and 1 recipe cream of mushroom) and leftover turkey or chicken. After Thanksgiving I canned the extra meat and bone broth I made, so perhaps that could be added. This is wonderful for a meal you don’t need to get groceries for. I made note on a recipe card. So far both recipes I’ve tried were company worthy. I’ve no doubt this soup is great however it’s prepared! Most delicious “mix” I’ve ever tried! We were expecting this soup to be on the bland side, but we ended up being blown away by how good it was. This soup looks great, and I would love to try it. I'm so pleased it is non GMO, but it's not organic, which means the ingredients in it may have been sprayed with products that are toxin. So, in that case, would they really be NON GMO??? Just saying. I love this wild rice soup. It's really good made with chicken broth and eaten vegetarian, or made with a roux mixed in when it's done with chicken or cooked breakfast sausage added after the roux. This one is my favorite! The other soups are really good too. I am very fond of soup, and as I live alone, I have a hard time with vegetables which spoil before they are used up. This is a wonderful solution and takes such little time to prepare. I plan to give a pack to a friend who is 90 and her husband is 99. He has problems with his teeth, so this should be a winner, plus the ease of preparation on her part. We who are "senior" and live alone need the nutrition without the fuss. This is a winner all around! Oh yes, I forgot to mention that it tastes great. This is the best soup mix I have found! I tried the recipe one reviewer shared for "just like Panera Bread" soup and it was delicious! There is so much you can do with this mix...all YUMMY! FIRST: The custumer service is GREAT! I ordered 6 bags on chance alone. I gave a few 1 lb. bags to friends, and all of us love this soup. Just got 8 more bags to stash for anoyher day. All being said :TRY THIS SOUP. I bought this because my family loves this type of soup. i have three grown children with discerning taste. They have all told me this is the go to soup. The finished product with my editions tasted like Panera Bread Chicken and wild rice soup. It simmers so long that you can not taste the canned taste in the chicken. You must make this one day in advance because it will thicken to the consistency of Amazing hearty soup. A little too thin for us the first day. Buy a lot I have already made it three times because they keep telling everyone they should try it. This is also a family business not some huge corporation! I purchased North Bay wild rice soup mix from my local Co-op earlier this summer. Little did I know how good this soup was and how easy it is to prepare. I will purchase this over and over again. I just purchased this wild rice soup because of it being so healthy, and not really knowing what to expect for flavor. This soup is a true gift from heaven. I have never enjoyed any soup that tasted this good. I put it into my rice maker and set the timer , and what a surprise, a real full flavor soup and very healthy as a plus. I will be maintaining this product in my pantry from now on. I found this wild rice soup mix the first time in a restaurant in northern Wisconsin and bought 2 pkg. just to try. Then I purchases some more as my family really liked this soup. I ended up giving all my brothers and sisters a pkg. for Christmas in their gift bag from me. They are raving about it! So, again, I need to order more to share. I personally like it as a chicken wild rice soup, so I add chicken and a cream soup, but any additional vegetables also add flavor, but are not needed. So keep making this product, please! Added a little "Better Than Bouillon No Chicken Base" and this wild rice soup turned out fantastic! Ordering more now. This is great wild rice soup. My favorite way is to put it on the crock pot with a few beef shanks and a couple boullion cubes. Chicken is also really good. My husband and friends love this wil rice soup. I use "Better than Bullion" Mushroom and Chix as the broth base. I add two cans of fire roasted tomatoes and fresh Thyme. I used chicken broth & added the remains of a roast chicken, garlic, basil & a little S&P to make a great wild rice soup! Sooo good! Will give this as gifts. I have been eating this soup mix for several years. It truly is phenomenal. Hearty, tasty and healthy. I was thrilled to find this website and be able to order a 5 lb bag. I cook it in chicken broth and add chicken and minced garlic for a hearty thick soup/stew. Turkey would be an excellent alternative. At Thanksgiving I like to cook only foods that were available at the time of the original Thanksgiving feast. This soup mix will be on the table this year as a side dish, probably cooked in turkey broth and with some sliced mushrooms added. I really like this website too and can't wait to devote some time to checking out all the other products. High quality and delicious wild rice soup. Ordered the small size to sample and after trying it ordered a five pound bag. Great for home and camp. Wonderful chewiness. I enjoyed this soup very much. I added various root vegetables and some spices to the mix. The liquid was vegetable broth. The cooking time was fast. I enjoyed the fact that it is low sodium and vegan. I made enough to enjoy for a couple of days. I will purchase this wild rice soup again when I run out. This wild rice and veggie soup is a super product. The suggested cooking is good and real easy. Great for a side dish too. Also, I added left over Turkey Breast last week, it was fantastic!! We have been out of work for over a year in our household. All the same we still put in an order for goods from North Bay Trading. We know we are getting good wholesome food and there will be no waste. The Wild Rice Soup is one of our favorite items. We can make just as much as we need and being dried the rest keeps well for a long time. And it tastes wonderful. As if that weren't enough, North Bay has the kind of customer service that you can't find too easily any more these days. Friendly, kind, helpful. I can't say enough about the company and their products. Thanks North Bay! One feels so good about this wild rice soup, healthy, tasty, and helping the planet too. A pleasure to prepare and serve to others (and one can have a bit left for lunches). Every time I get this as a gift from my mom and dad who own a cabin up in Outing, MN - I am like Pavlov's dog. (drool, drool) Good as a vegetarian soup, turkey and chicken wild rice soup, as well. Perfect after Thanksgiving with your leftover turkey stock and turkey. I add rotel tomatoes, basil, garlic, carrots, celery, onions, a bay leaf and salt and pepper. Perfect winter meal, even in Tennessee! The best wild rice soup, I have made it as a veggie soup, with buffalo burger, chicken and turkey. Next time I'm adding Italian sausage. I have recommended it to many others and given it as gifts! We made this wild rice soup with chicken stock and a ham hock. So great for our First Day of Snow dinner! LOVED it. Oh my goodness! This soup is SO amazing! Everyone needs to buy some! I need to get some more! Excellent review by Greg B. Wild Rice Soup was fantastic, and the mixed vegetables and green beans were perfect for our 6 day wilderness canoe trip. Extremely lightweight, easy to carry, quick to prepare and even more important tasted great. Thanks for such a great product. Easy to Prepare — vegetarian as is, modify as you wish. Use 1 part soup mix and 8 parts water, vegetable broth, or chicken stock. Then cover and simmer 45-60 minutes. For a side dish, you may want to cook a bit longer and then drain or steam off excess water. Experiment with seasonings such as garlic, basil, bay leaves, salt, and pepper. Try adding tomato puree or condensed mushroom soup. Often made with diced chicken, beef, or ham. Freezes well — Prepared soup may be frozen and then reheated. Yield — One cup of dry soup mix weighs almost 1/3 pound and makes about 8 cups of soup. Storage — Best if used within 12 months of purchase. Store tightly sealed in a dry location away from sunlight.